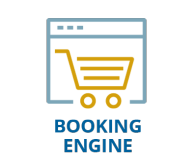 Please contact us if you are looking for a web development partner for your booking engine website and visit our portfolio. W3care Technologies is an eminent web and mobile app development company based in India. We are expertise in mobile application development for the android, iOs, Hybrid and website development as well. We have experienced teams of designers, developers, and digital marketers. Our teams work with fully dedication and determination. We follow agile methodology to develop best website/mobile application.